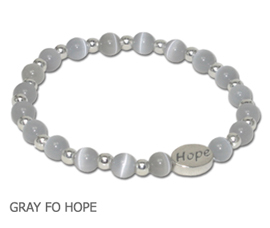 Gray is the awareness color for Brain Cancer, Diabetes or Asthma. 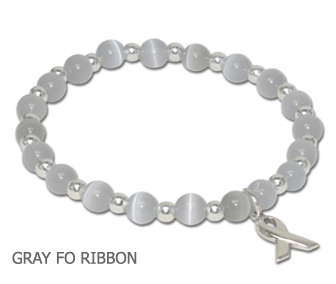 Transparent gray faceted beads with an Awareness ribbon charm on jeweler’s elastic. Available in sterling silver or silver plate. 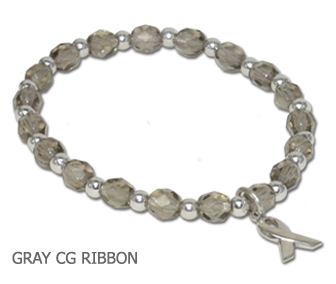 Opaque gray fiber optic beads with an Awareness ribbon charm on jeweler’s elastic. Available in sterling silver or silver plate. 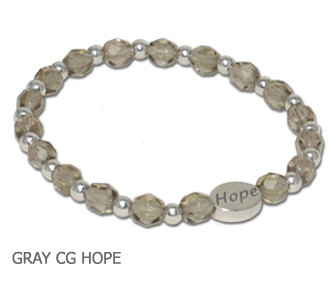 Transparent gray faceted beads with a Hope bead on jeweler’s elastic. Also available with a Survivor bead. Available in sterling silver or silver plate with a pewter bead. 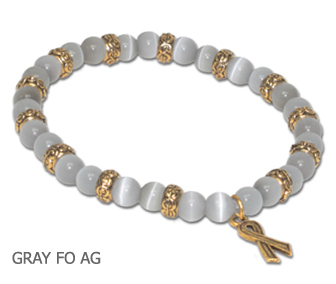 Opaque gray fiber optic beads with a Hope bead on jeweler’s elastic. Also available with a Survivor bead. Available in sterling silver or silver plate with a pewter bead. Transparent gray faceted beads with antique gold, lead-free pewter Awareness ribbon and spacers on jeweler’s elastic. Opaque gray fiber optic beads with antique gold, lead-free pewter Awareness ribbon and spacers on jeweler’s elastic.